Meet the 2018 SilverSneakers Swanson Award Winner! Sally Miller, 72, builds both personal strength and a welcoming, supportive community every time she enters the gym. Sally Miller was on the phone with a friend when she got another call. She glanced at the number—an area code she didn’t recognize—and sent it right to voicemail. She figured it was a huckster peddling a cruise or some other scam for seniors. And besides, the DeWitt, Michigan, resident had more important matters to attend to—helping her friend and fellow artisan solve a pressing crafting problem. “You know, sometimes even a 72-year-old is too busy to be inconvenienced,” she jokes. If the call was important, Sally reasoned, surely they’d leave a message. They did. 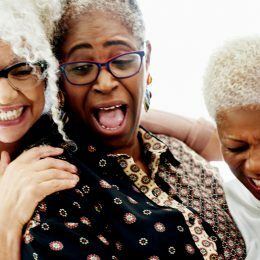 Turns out Sally blew off a congratulatory call from SilverSneakers telling her she was one of 10 finalists for this year’s SilverSneakers Swanson Award, which honors a member who isn’t just dedicated to improving his or her own personal health, but actively emboldens others to do the same. Sally passed the news to her son, Robb, who had nominated her for the award. It was the least he could do for his mom, whose infectious enthusiasm has helped grow the SilverSneakers program at his gym, Snap Fitness in St. Johns, Michigan, to 25 members and counting. “For us, fitness is truly a family affair,” Sally says. If the finalist call was a pleasant surprise, the news of her ultimate victory was even sweeter. After thousands of votes were cast—thanks in no small part to Robb’s Facebook push—Sally was recently named this year’s Swanson Award Winner. It’s a nice accolade, she says, for someone who is simply trying to do her best and keep her gym buddies company. Indeed, the workout warrior didn’t just snag 37 percent of the votes for crushing her cardio classes—she won because of the fitness friendships she has forged and the deeper bonds she brokers long after the gym lights shut off. Growing up, Sally wasn’t some kind of exercise savant. She stayed active, sure, but her athletic options were rather limited in the Detroit suburbs. Though there were slim pickings for breaking a sweat, Sally found ways to keep in shape as she got older. After marrying her husband, Richard, and settling in DeWitt, she took a job at Blue Cross Blue Shield of Michigan and walked the three-mile track on campus every day for 19 years. Once she retired, Sally moved her routine to the scenic country roads that surround her house. She still takes a 50-minute walk at least twice a week, or whenever Richard sets off on his own workout. She would’ve been content continuing with her walks and getting her kicks elsewhere—like vacations to Vegas and weekend jaunts to the family cottage on Crooked Lake—but when Robb decided to leave his job as a corrections officer and open a gym three years ago, Mom wanted in. With a little bit of financial help from his folks, Robb’s Snap Fitness was officially open for business. And the gym’s most ardent member was about to leave her mark. Though Sally had access to Snap in the winter of 2015, she didn’t become a mainstay until later that spring. (“Snow and slush and stuff just isn’t my thing,” she says.) But once the warmer weather made her 12-mile commute easier, Sally began trying out all the equipment her new fitness playground had to offer. 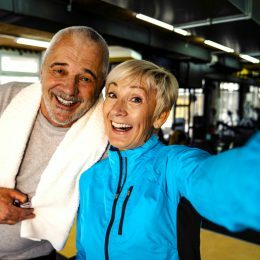 She immediately took to the treadmill and hustled right alongside those patrons she calls “the big boys”—“the 30- to 40-year-olds who I could keep up with, no problem,” she says. Still, Robb urged her to also work out with fellow seniors, because he sensed she’d make an impact on people who weren’t quite up to her speed. So Sally signed up for twice-weekly, 45-minute classes offered by her gym. Though the curriculum changes every session—some days the students focus on strength and others they work on balance—there’s only one constant requirement for each class: Everyone has to have fun. And it’s become Sally’s job to make sure they do. Sally says the classes have unquestionably made her stronger, and she takes pride in flashing the “tiny walnut muscles” in her arms. But Sally quickly realized her role at Snap should be less passive participant and more social ringleader. “My goal is to inspire and lighten them up,” she says. Gestures like these have earned Sally the respect and admiration of her peers—and their Swanson Award votes. 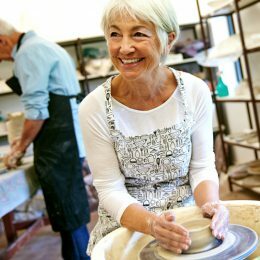 SilverSneakers gives you free, unlimited access to 14,000 gyms, YMCAs, and other fitness locations around the country, plus classes designed to keep older adults strong and independent. Check your eligibility instantly here.